In the United States, nonprofit organizations provide a wide range of vital services to low-income people, but are often hampered by their inability to buy or upgrade the buildings where they operate. Because of the unconventional or irregular nature of many nonprofits' finances, banks are usually reluctant to give them traditional mortgage loans. Moreover, other pillars of support for non profits - public-sector funders, philanthropic foundations, and individual donors - generally prefer to underwrite programs, not facilities. All of which makes the Midwest Nonprofit Lenders Alliance (MNLA), the subject of a Joint Center case study, noteworthy. This consortium of three community development financial institutions (CDFIs) came together specifically to provide facility loans to nonprofit organizations serving low-income residents of the Minneapolis-St. Paul, Cincinnati, and Dayton metropolitan areas. Catalyzed by a $3 million award from the JPMorgan Chase & Co. Partnerships for Raising Opportunities in Neighborhoods (PRO Neighborhoods) program, MNLA builds on the unique strengths of its three members: IFF (originally named the Illinois Facilities Fund), which acts as lender, real estate consultant, and developer throughout the Midwest; the Nonprofits Assistance Fund (NAF), which provides loans, financial training, and management advice to its nonprofit clients; and the Cincinnati Development Fund (CDF), which has specialized in loans to develop housing and rehabilitate commercial buildings in low-income neighborhoods in Cincinnati and nearby Kentucky. By sharing capital, underwriting expertise, and knowledge of local markets, the three entities have provided more than $13 million to 14 nonprofit entities looking to purchase or upgrade their facilities. 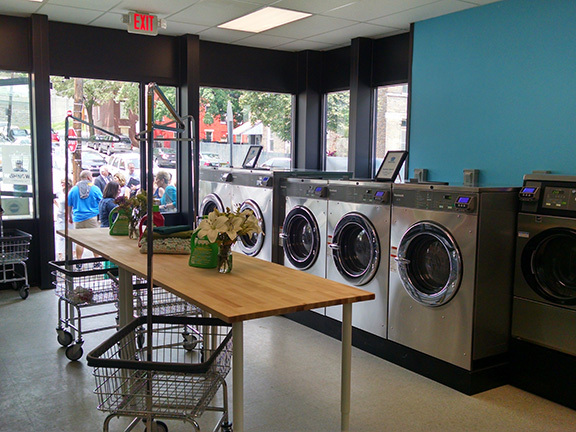 Community Matters, a Cincinnati nonprofit, opened the Wishing Well Laundromat in Cincinnati's Lower Price Hill Neighborhood using a loan from MNLA partner Cincinnati Development Fund. Know your markets. This means not only identifying and reaching potential borrowers, but also learning about the competition for those borrowers. According to Kate Barr, chief executive officer of NAF, MNLA's leaders initially thought they could target nonprofits that fell just short of traditional banks' credit standards. But in the first year of the partnership, they discovered "that strata doesn't exist." Instead, the partners found clients who needed funding for unique (but financially viable) transactions that traditional banks would not finance, like converting an abandoned grocery store into a community space. Armed with this knowledge, MNLA aimed an intensive outreach campaign at community organizations and professional networks and created a viable market niche. Some worthy nonprofits require non-standard loans. Underwriting these types of loans requires a deep knowledge of the prospective borrowers' finances, operations, and goals, which allows lenders to match the needs and financial resources of their customers. Making a loan to Cincinnati's Bi-Okoto Drum and Dance Theater, recalls CDF president and CEO Jeanne Golliher, "took a lot of sitting down, rolling up sleeves, and getting comfortable with the realities behind their financial statements." Although such personalized loans are time consuming, they provide needed credit to agencies that otherwise might now have been able to receive it. CDFIs may find fruitful collaborations with unexpected partners. Different areas of expertise may offer the possibility of complementary business lines. Although CDF's small staff regularly approved loans for affordable housing projects built by nonprofit entities, the expertise and familiarity needed to make facility loans was, Golliher observes, "beyond our capacity." Within the MNLA umbrella, however, the lead organization, IFF, not only provided training in underwriting such loans, but also the capital to fund them. Partner organizations should seek common understanding of key terms, concepts, and practices. Lending practices are complex, and lending practitioners use shorthand to refer to different aspects of their work. So it is that key officials in organizations, even in CDFIs with similar missions, often use different language, approaches, and practices when crafting loan packages. Therefore, groups working together need to make sure that they agree on the meaning of the many terms and actions involved in the lending process. Particularly in the early stages of a collaborative venture like MNLA, explains Joe Neri, CEO of IFF, "you really cannot overdo" the time and attention paid to defining terms and practices. 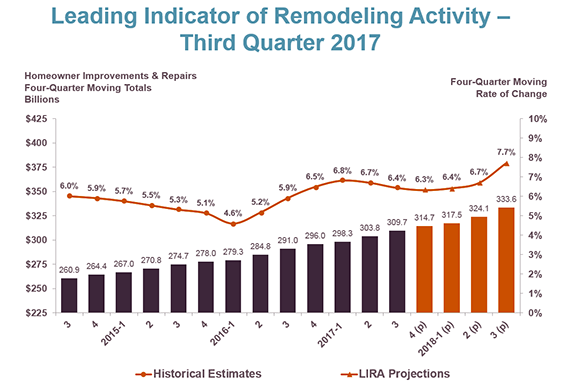 Accelerating growth in residential improvement and repair expenditures is anticipated through the third quarter of 2018, according to our latest Leading Indicator of Remodeling Activity (LIRA).The LIRA projects that annual gains in home renovation and repair spending will increase from 6.3 percent in the fourth quarter of 2017 to 7.7 percent by the third quarter of next year. Recent strengthening of the US economy, tight for-sale housing inventories, and healthy home equity gains are all working to boost home improvement activity. Over the coming year, owners are projected to spend in excess of $330 billion on home upgrades and replacements, as well as routine maintenance. 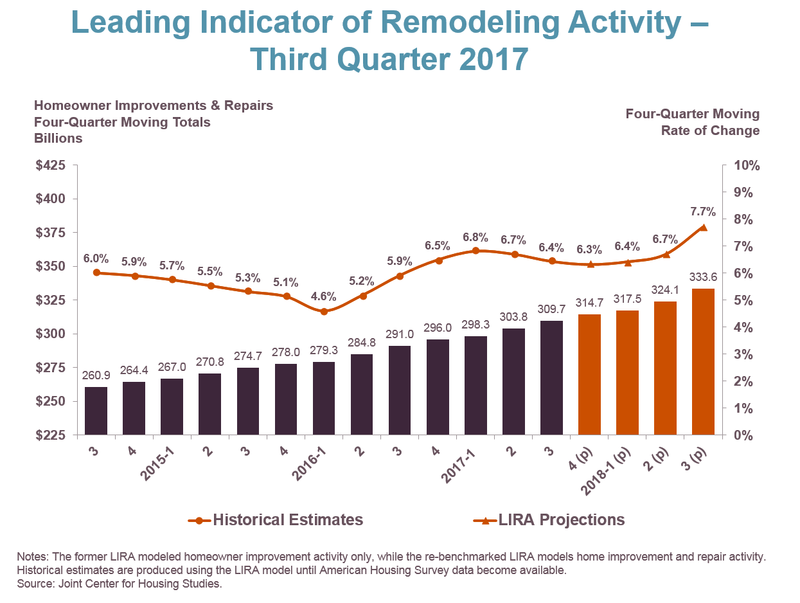 And while it’s too early for our LIRA model to capture the effects of recent hurricanes and other natural disasters experienced around the country, there is certainly potential for even stronger growth in remodeling next year as major reconstruction and repairs get underway in affected regions. For more information about the LIRA, including how it is calculated, visit the JCHS website. While many believe that home prices in rural areas are largely stagnant, this is not the case, according to a new Joint Center analysis from the Federal Housing Finance Agency (FHFA). Rather, non-metro home prices are dynamic, highly variable, and growing—much like home prices for the nation as a whole. Nationally, home prices grew significantly over the last half-decade, following years of decline in the aftermath of the housing crisis. But these broad indicators mask significant variation by region, market, and even neighborhood. While these trends were discussed extensively in this year's State of the Nation's Housing report and on our blog, those analyses focused almost exclusively on the roughly 62 million homeowners living within metropolitan areas, where 83 percent of the country's owner-occupied units are located. Rather than stagnating, home prices outside the metropolitan areas grew considerably between 2000 and 2016. In nominal terms, non-metro home prices grew 58 percent and real non-metro home prices grew nearly 15 percent. Moreover, by the fourth quarter of 2016, nominal non-metro and rural home prices were two percent above their pre-recession peak—the same as national home prices at the same point. However, when adjusted for inflation, home prices in non-metro areas were still 11 percent below their peak, which again, is somewhat similar to national patterns (Figure 1). Note: The US non-metro index is a weighted-average of state non-metro HPIs, with each state's value weighted by its share of non-metro detached single family housing units. Real home prices are adjusted for inflation using the CPI-U for All Items less shelter. Source: JCHS tabulations of the Federal Housing Finance Agency, All-Transactions House Price Index. While significant, these increases were more modest than the gains experienced by the nation as a whole. Nationally, real home prices grew 23 percent in 2000-2016, about 8 percentage points more than prices in non-metro areas (Figure 2). The difference is largely due to the more modest cyclicality of non-metro home prices movements during and after the recession. In the immediate aftermath of the housing crisis, national home prices fell severely for several years before starting to rise steadily in early 2012. In contrast, home prices in non-metro areas were mostly stagnant from 2011 to 2014, and, compared to metro areas, have grown less quickly since. As a result, between 2012 and 2016, the percentage-point increase in non-metro home prices was greater than the percentage-point increase in statewide prices only in Alaska, Hawaii, Mississippi, Montana, and Nebraska. The gaps were largest in North Dakota (13 percentage points greater), Nebraska (12 percentage points greater), South Dakota (11 percentage points greater), New Mexico (7 percentage points greater), and Louisiana (6 percentage points greater). In contrast, the increases in statewide prices most exceeded rural prices in coastal states, where prices in metropolitan areas have grown significantly. The gaps were greatest in California (26 percentage points), Hawaii (23 percentage points), Virginia (22 percentage points), Oregon (19 percentage points), and Maryland (18 percentage points). Non-metro home prices rose more slowly in the run-up to the housing crisis, and rarely fell as far in the aftermath. Between 2000 and 2007, real non-metro home prices increased by 28 percent, far less than the 41 percent increase for all single-family homes. However, in about half of the 47 states with non-metro areas, the percent increase for all single-family homes. However, in about half of the 47 states with non-metro areas, the percent increase in non-metro home prices exceeded states-wide home-price gains in the run-up to peak. After the crash, real national home prices fell below 2000 levels briefly in 2012, while non-metro prices remained about three percent above their 2000 levels. Moreover, this pattern held true in most states. In only 10 of 47 states were the recessionary-low home prices (relative to 2000) in non-metro areas lower than for the state overall. Unclear signals for the future. While this analysis shows that non-metro house prices generally follow national patterns, since the recession price growth in rural areas has been slower than in the nation as a whole. The homeownership rate in non-metro areas was also about 71 percent in 2015, nearly 9 percentage points higher than in metro areas. These differences held across racial and ethnic groups, as well as for low- and moderate-income households. Collectively, this indicates that these markets merit close attention in the coming years. Foreclosures have negative effects not only for the people who lose their homes, but also for the neighborhoods where they lived. Although New York City's housing market fared better than many other markets during the recession, it was not immune to the problems associated with that downturn. Illustratively, in 2007 and 2008, there were nearly 14,000 foreclosure filings annually, double the number in 2004. In 2009, the number increased to over 20,000. The number of foreclosure auctions, however, was much smaller, ranging from 3,000 to 4,500 a year between 2007 and 2009. This foreclosure activity was also highly concentrated. Between 2007 and 2009, over half of the city's foreclosure filings occurred in just nine of the city's 55 sub-borough areas (SBAs), all of them in Brooklyn or Queens. Moreover, over half of the city's auctions took place in just six SBAs. Not all specific areas with the highest concentration of foreclosure auctions, however, were among the areas with the highest concentration of foreclosure filings. Rather, the share of foreclosure filings that result in scheduled foreclosure auction varied considerably across boroughs, from less than 10 percent being scheduled for auction in parts of Brooklyn to more than 40 percent in parts of Queens. My coauthors and I hypothesized that the number of scheduled foreclosure auctions surrounding a property that had received a foreclosure filing is positively associated with the likelihood of that property itself reaching auction, net of other factors. Since foreclosure filings do not necessarily involved a transfer of ownership, however, we thought they might not have as strong an association as auctions may have. Drawing on data about individual property and neighborhood characteristics in addition to foreclosure activity, we found that levels of neighborhood foreclosure activity in both phases were, in fact, associated with an individual property's outcome, but in different directions. Holding constant individual property and neighborhood characteristics, as the number of nearby properties with a foreclosure filing increases, the probability that an individual financially-distressed property will be scheduled for foreclosure auction decreases. This pattern is reversed for properties in the later phase of the foreclosure process. As the number of nearby properties scheduled for auction increases, the probability that an individual financially-distressed property will be scheduled for foreclosure auction also increases (See Figure). These findings also suggest that at least in New York, banks and loan servicers may have delayed the processing of foreclosures in areas with larger numbers of properties with foreclosure filings. They may have done so because foreclosed properties may not sell as quickly or as profitably as in more desirable areas where there are fewer distressed properties and/or where foreclosed properties sell right away. Future research should examine these practices in more detail, not only in New York, but in other states as well and, in doing so, underscore the importance of financial institution practices not just in the lead up to the Great Recession, but throughout the recovery process as well.